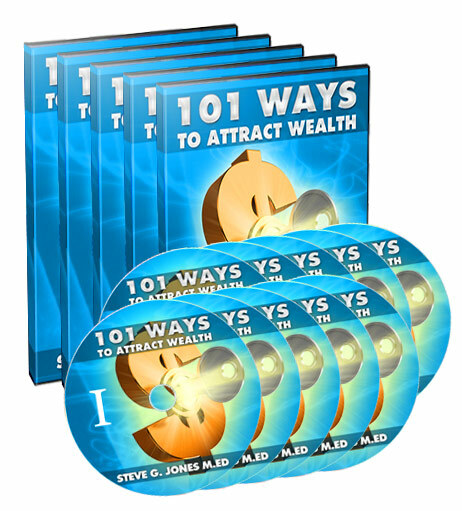 101 Ways To Attract Wealth - Steve G. Jones, Ed.D. "From The	Man Called 'The Millionaire's	Secret Weapon', Here's The Same Roadmap Millionaires Use To Create Unlimited Wealth While Everyone Else Struggles..."
Dr. Joe Vitale, Star of "The Secret"
From the desk of Dr. Steve G. Jones, Ed.S. So, what's the secret to attaining true wealth... even if you've struggled all your life, paycheck to paycheck? Why do some seem to attract wealth with frustrating ease... while you can't seem to push ahead? What's the next step you need to take? First, let me tell you what you should NOT do. Whatever you do, do NOT go out and find another "step by step guide to making money doing XXXXX." It's not that they don't work. Yes, having a roadmap like that is an important step, but FIRST, you MUST "optimize" your mind and attitude to take any blueprint like that... and make it work! EVERY SINGLE MILLIONAIRE is equipped with something you don't have yet... but you desperately need. Every millionaire that ever built themselves from nothing... into extreme wealth... first learned the MILLIONAIRE MINDSET. No, I'm NOT talking about boring economics and accounting info, or anything like that. What I'm talking about is THRILLING and MOTIVATING. What I'm talking about is HOW to understand the "trick" to making money... even before you've made your first dollar. Millionaires and billionaires don't necessarily know all the most potent secrets to becoming wealthy... BUT, they have something that, right now, you DON'T have... but you can, if you listen closely. So listen closely! 1. The wealthiest people have the "GLUE" that transforms their practical knowledge of how to make real money... into a SIMPLE and ACTIONABLE reality. It is the secret ingredient every single wealthy person shares, period. 2. This "GLUE" is hidden in the "Millionaire Mindset." The GLUE is not WHAT the practical secrets to wealth are. The GLUE is HOW you put those practical secrets to use. What Do Those Secrets Mean? When you look at a millionaire... someone whom you envy, what strikes you? Is it their "encyclopedic" knowledge of the practical outline for becoming wealthy? Sure, that might be part of it (even if you already know everything they do). But when you look closer, what do you see? You see how all millionaires seem to command a personal potency, a conviction, and the simple knowledge that whatever they do to make more money... will work. They can see their new earnings laid out on the table in front of them. They can taste the satisfaction of knowing their bank account just got some extra padding. And they know that all this wealth isn't going to stop coming their way. They have the "Millionaire Mindset," and nothing is going to stop them. "How Can I Wield This "Millionaire Mindset," Command Wealth Creation At Will, And KNOW I'm Going To Become Wealthy... If I can't seem to make ANYTHING work?" Before I tell you how, let me tell you why I'm sitting here, claiming to be the expert that can show you "salvation." Who Am I? And Why Should You Trust Me?" As you already know, my name is Dr. Steve G. Jones, Ed.D.. What you might not know is that I'm proud to say I'm regarded as one of the most effective (and well known) hypnotists in the world. Yes, in the world. In other words, I know the secrets to accessing the deepest recesses of a person's subconscious (even if they're skeptical), and helping them "magically" transform themselves into unstoppable agents of change in their own lives. And that's only one of the reasons I'm called "The Millionaire's Secret Weapon." People have come to me with problems that have plagued them for decades... problems they've tried to fix every way imaginable... and then leave my office a new person). That's why people who come to my office pay literally $25,000 for one session: because it's worth every penny. It doesn't stop there. I've collaborated with some of the biggest names out there... experts on the Law of Attraction like Joe Vitale (star of the blockbuster movie "The Secret), or personal transformation guru Joe Rubino. I've created a collection of literally thousands of self-hypnosis recordings... and have sold millions of copies. People keep coming back... because it works. On top of that, I've made millions of dollars for myself. And I wasn't always like that... I had to build that wealth for myself, just as you are doing today. In other words, I know exactly where you are right now... and I know exactly how to get where you're going. I have the professional expertise PLUS the personal experience that makes me one of the "go to" people to talk to. Am I some "miracle worker" who can change people at the snap of my fingers. Not at all. I've just devoted my entire life to discovering and implementing proven and profoundly effective ways to change people from the inside out. It is my passion in life... helping people like you finally breakthrough and achieve their wildest dreams. And it's all because... I know it's possible! I've seen the transformations right before my eyes! If you want to make a positive change in your life, Dr. Steve G. Jones, Ed.D. can make the difference. He did with me. WOW! 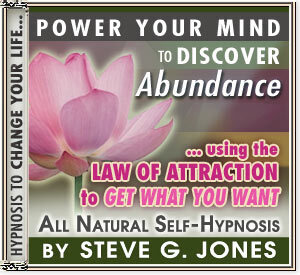 No wonder Steve is the leader in hypnotherapy. How lucky are those who have had the benefit of his genius! It is a great honor for me to write a few words for Dr. Steve G. Jones, Ed.D., who has had tremendous successes in the art and science of both hypnotherapy and NLP. He is not only the founder of the American University of NLP, but also an expert NLP trainer. He has a Bachelor's degree in Psychology, Master's degree in education, an NLP trainer certification, a hypnotherapy certification, and is now completing his doctorate in education. Listen to him! My only regret is that I didn't discover your site sooner! Steve is in a class of his own. I've experienced transformations in myself that border on the miraculous. His soothing voice and vivid imagery can't help but bring about positive and lasting results. I can't say enough about the power this man's methods and would encourage anyone to see for themselves just how amazing a truly gifted professional can be. The man is an absolute wizard, not some disappointing "man behind the curtain." Probably the best money I've ever spent. I was skeptical at first, but now I'm a believer. I'm a 45 year old lady who never dreamed she could change. I'm a new woman. Don't wait, it WORKS !!! I'm a salesman and I came to Dr. Steve G. Jones, Ed.D. for help in boosting my income. In the WEEK following my session, I made an extra $10,000 in commissions. I now look back and laugh at the small price he charges...I used to think it was a lot...now I'm on a whole new level of thinking...and income...Steve, you ROCK!!! Am I here today to offer you a self-hypnosis series? No. I'm offering you something completely different... something that will not only help you clear your unconscious barriers to wealth... but something that will empower you with conscious, actionable, and undeniable strength. I'm here to equip you with the "Millionaire Mindset." What if you could go to sleep tonight, knowing you had the final step... the missing piece... in your hands? What if you finally had that unshakable confidence you've longed for that will virtually guarantee your rise to wealth? Throw aside your doubts and self-sabotage... trash your inconsistencies and hesitancy... and take what's yours: Let me give you everything you need, step-by-step, to attain the wealth you're destined for. Let me show you the keys to the millionaire's secret... the keys to attaining the "Millionaire Mindset"
This 10-part audio training lays out a proven, well-established roadmap that will place the final puzzle piece... the path to unlimited wealth... right in your hands. Is it as simple as pushing a button? Can you be "lazy" and still make it work? No. This isn't a bunch of hype that will solve everything without an ounce of effort. And that's good news for you. BUT, it WON'T be an endless, over-padded program that will take hours of your time filled with impossible tasks. This, my friend, is the real deal: a simple, straightforward, step-by-step plan that's guaranteed to work. Don't let your past financial struggles bring you down... a simple formula revealed. How to take advantage of the "time delay"
How to harness the universal "Power of Intention"
How to transform your emotions and thoughts with proven "automatic triggers"
How to banish "shyness" and accept that you deserve true financial success! Consider the alternative: I've already helped thousands of people accomplish what you're looking to accomplish right now. The only difference is that you don't have to spend thousands of dollars to come to my office. This is as close as it gets... and your investment will literally be pennies on the dollar. Are you ready? Are you ready to take your dreams and make them realities? Are you ready to say goodbye to disappointment after disappointment? ARE YOU READY TO LIVE THE LIFE OF A MILLIONAIRE? This is your chance to experience the same conviction, confidence, and near "magical powers' that all millionaires have in common. This is your chance to wield the true "Millionaire's Mindset." And as soon as you see exactly what I'm giving you, you'll see exactly why I'm so confident in making such bold claims. Will it cost you thousands of dollars? Will it mean huge sacrifices to make it happen? I think any person who sees what I'm about to give you would agree that the potency of this gift to you would be worth its price in gold... even thousands of dollars made in a solid investment. But that's not my goal. As I said, this is about you. This is about my desire, my mission to help people like you, people who are ready to take their wealth io their own hands... people who haven't given in to the hopeless mindset that shackles thousands of people. Your investment is not thousand of dollars... your investment is only $27. That's it. Nothing more to pay, ever... but yet you get a lifetime of wealth to show for it. And you'll get access to the entire program in the next 5 minutes, ready for immediate download. In fact, I'm so confident in my ability to give you the keys to true wealth, that I'm willing to put all the risk on my shoulders. I'm not happy unless you're happy. So here's my "No Small Print" Guarantee. 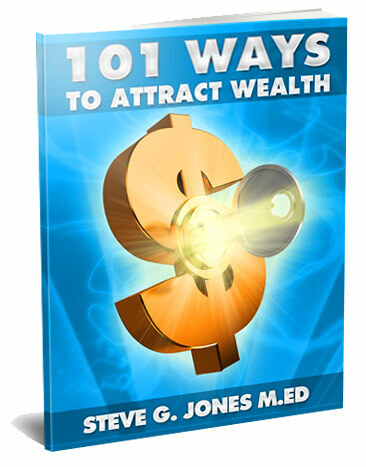 Try "101 Ways To Wealth" today and put it through the ringer. Use every strategy and technique in this step-by-step program for a full 60 days. You be the judge. If this program isn't everything I've promised it will be, or if you're unhappy for any reason, let me know and I'll give you a 100% refund... no questions asked. 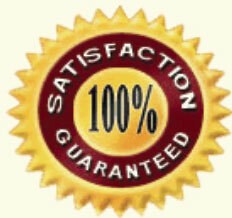 I have no problem with making this guarantee, as my programs have proven themselves again and again. Fair enough? I know that you might struggle with the "Conscious Monster." That's when your mind sneaks in when you're trying to do good work, and sabotages you with doubts, with fears, with skepticism, and self-sabotage. So what's the secret to throwing that into the wind? It's simple: My expertise in hypnosis gives me the tools you need to literally quiet all of those negative influences, and give you the clear head and laser-sharp focus you need to take your wealth to the next level. This guide, ready for immediate download, contains the entire step-by-step blueprint, available in written form. You can print it out, take notes, highlight important passages, and keep it by your bedside, your desk, or take it with you everywhere you go. It is the ultimate companion for this program... my gift to you for signing up today. Simply said, listen to this self-hypnosis recording, and you WILL clear away all the mental hurdles that can sabotage your chance at true wealth. Yes, in '101 Ways To Wealth", I'm giving you the "keys to the vault" filled with the secrets to the Millionaire Mindset you'll likely not find anywhere else... but if your mind is cluttered with self-sabotage and nasty distractions, it just won't do the trick. I'm sure you have personal experience with this. BUT, with this self-hypnosis program, also available for immediate download, you'll have all you need to make sure every solid secret to wealth I'm about to give you... goes right where it needs to go: into action! Or Take Control Of Your Life? This is the moment of truth. This is the moment where you have to make a critical decision. Even if you still have a bit of skepticism in you, you know, deep down, that what I'm telling you is true. And you know, deep down, that there's a good chance I know what I'm talking about (people don't pay me $25,000 for a session just because I have a good pitch... and I didn't make my millions through dumb luck). Yes, of course you can choose to shut down all those voices, save yourself from the potential let-down, and walk away. But why would you? Especially when you're backed by a 60-Day Money Back Guarantee? (This guarantee is managed by a third-party company. They specialize in fast refunds). And especially when this literally has everything you need to transform practical knowledge on building wealth... into a cold, hard reality. All you have to do is click the button below, get immediate access to the 10-part audio training and the two bonuses, jump in, and put these proven steps to work. I'll do the rest. Deal? Just make sure you agree to my terms and conditions by clicking the check box below (standard legal stuff) and click "Add To Cart" and you'll get everything on the next page! Dr. Steve G. Jones Ed.S. P.S. Why do you keep struggling to build true wealth, while some people seem to do it with frustrating ease? What's the difference between you and all the millionaires out there? They're not smarter than you. They're not even necessarily better educated about building wealth. They have the key component that you need... the "Millionaire Mindset." And that's exactly what I'm giving you today. Take this chance... and watch how fast everything changes. P.P.S. Not only is the investment for this program virtually nothing (especially when people pay me $25,000 for a one-on-one session)... but you're backed by a complete, 60-day money back guarantee. You can't lose... unless you choose not to act. Is it worth it? Take control. Sign up now.